Biking is allowed throughout the park, but if you want to use the Mountain Bike Trails you have to buy a pass, sign a waiver, and watch a short safety video about the trails. If you’re into mountain biking…this is well worth it! Over 10 miles of various bike trails await you at Markham Park. They vary wildly in degree of difficulty so you will never run out of fun or a challenge. Helmets are required on all Markham Park mountain bike trails of course and there’s a $5 fee to use the trails. You can also get an annual pass, call the park or visit the park office for more details. These trails are built and maintained by volunteers and you can find out more about helping out or donating to the bike trails’ upkeep at the Markham Park Trail Building Fund site. The Markham Park bike trails are absolutely amazing and they can’t be maintained without your support, so get out there and volunteer! Markham Park trail maintenance is the first Saturday of each month 8:30am. Meet at the front gate of the trails. 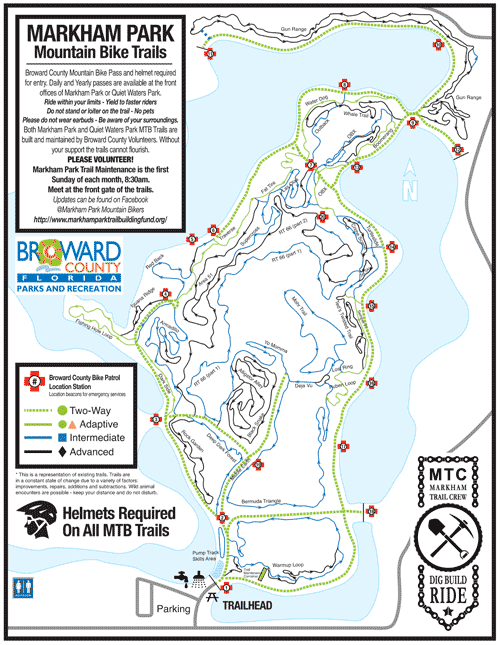 All riders must display a current MTB access card upon entering the trails. Annual pass access card can be purchased for $25 plus tax. A one-day access pass may also be purchased for $5 plus tax. All riders are required to view a safety video and complete a release waiver at the park office before entering trails. Riding the trails is at your own risk. 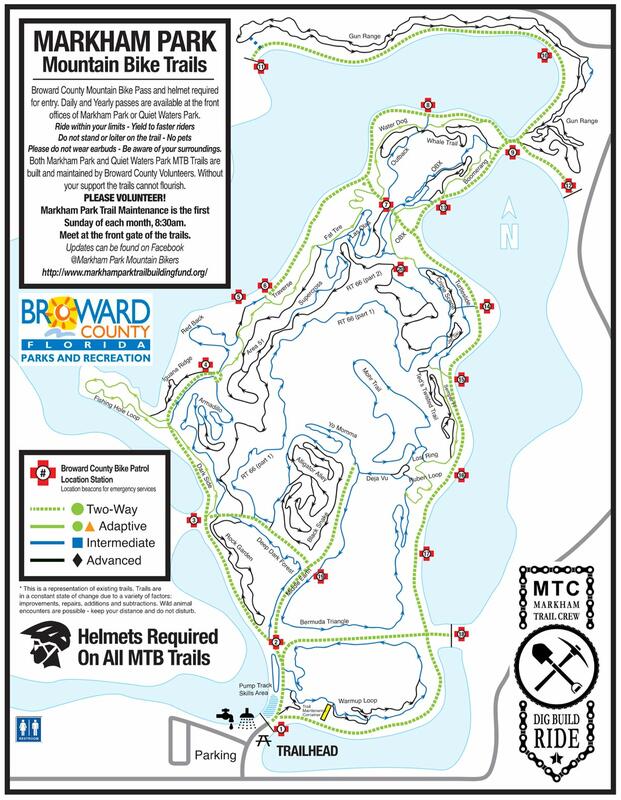 Broward County Mountain Bike Pass and helmet required for entry. Full-face helmet and pads are recommended. 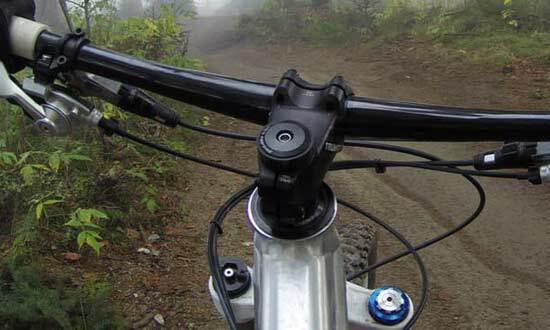 Mountain Bikes only: Hybrids, non-specific mountain bikes, bike trailers and child seats are not allowed on trails. Markham trails are for bike riding only: NO pedestrian, pets, horses, motorized bikes or ATVs are permitted. Obey all posted trail and caution signs. Riding outside of marked trail is prohibited. No alteration of any trail or terrain is permitted. Illegal entry/use of trails outside of Park operating hours is trespassing and strictly prohibited. Violations are reported to the local Police Department. Trailhead gates are locked at sunset. All riders must exit trailhead gate prior to sunset or they will be locked inside. Notify Park management of unsafe situations and conditions needing attention on the trails. Report all observed injuries to Park management in the office immediately. In the event of a storm, all riders must exit trails when the lightning prediction warning horns sound and may not ride until the all-clear signal (three short blasts) is heard. No littering! Pack it in and pack it out.